Bradenton (/ˈbreɪdəntən/ BRAY-dən-tən) is a city in Manatee County, Florida, United States. The U.S. Census Bureau estimated the city's 2016 population to be 54,437. 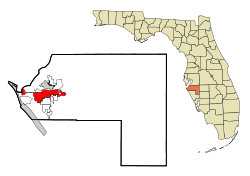 Bradenton is a principal city of the North Port–Sarasota–Bradenton metropolitan statistical area, which had a 2017 estimated population of 702,281. It is the county seat. Bradenton (originally spelled "Braidentown" and then amended to "Bradentown") was established in 1842. The original town of Bradentown was incorporated in 1903. The city took the name of Dr. Joseph Braden, whose nearby fort-like house was a refuge for early settlers during Seminole Indian attacks. The current city of Bradenton was formed in 1943, when the Florida legislature merged the cities of Manatee (incorporated in 1888) and Bradentown. According to the United States Census Bureau, Bradenton has a total area of 14.44 square miles (37.4 km2), of which 12.11 square miles (31.4 km2) is land and 2.33 square miles (6.0 km2) (16.14%) is water. Bradenton is located on US 41 between Tampa and Sarasota. The area is surrounded by waterways, both fresh and saltwater. Along the Gulf of Mexico and into Tampa Bay are over 20 miles (32 km) of Florida beaches, many of which are shaded by Australian pines. Bordered on the north by the Manatee River, Bradenton is located on the mainland and is separated from the outer barrier islands of Anna Maria Island and Longboat Key by the Intracoastal Waterway. Downtown Bradenton is located in the northwest area of the city. Home to many of Bradenton's offices and government buildings, the tallest is the Bradenton Financial Center, 12 stories high, with its blue-green windows. The next tallest is the brand new Manatee County Judicial Center with nine floors, located next to the historic courthouse. Other major downtown buildings include the Manatee County Government building and the headquarters of the School Board of Manatee County. The eastern side of Bradenton is growing at a rapid rate. Starting as the popular subdivision Lakewood Ranch, it is now becoming a heavily populated part of town. Most of the communities are newer than in West Bradenton. However the majority of foreclosures in Manatee County have taken place in that area because a much higher loss in value happened compared to the areas of West Bradenton which is located nearer to the beaches. As of the census of 2000, there were 49,504 people, 21,379 households, and 12,720 families residing in the city. The population density was 4,088.5 inhabitants per square mile (1,578.3/km2). There were 24,887 housing units at an average density of 2,055.4 per square mile (793.5/km2). The racial makeup of the city was 78.14% White, 15.11% African American, 0.79% Asian, 0.29% Native American, 0.05% Pacific Islander, 3.91% from other races, and 1.71% from two or more races. Hispanic or Latino of any race were 11.26% of the population. There were 21,379 households out of which 23.0% had children under the age of 18 living with them, 43.5% were married couples living together, 12.1% had a female householder with no husband present, and 40.5% were non-families. 34.1% of all households were made up of individuals and 17.8% had someone living alone who was 65 years of age or older. The average household size was 2.24 and the average family size was 2.85. In the city, the population was spread out with 21.6% under the age of 18, 7.7% from 18 to 24, 25.3% from 25 to 44, 19.9% from 45 to 64, and 25.4% who were 65 years of age or older. The median age was 42 years. For every 100 females, there were 90.3 males. For every 100 females age 18 and over, there were 85.9 males. The median income for a household in the city was $34,902, and the median income for a family was $42,366. Males had a median income of $28,262 versus $23,292 for females. The per capita income for the city was $20,133. About 9.7% of families and 13.6% of the population were below the poverty line, including 22.3% of those under age 18 and 8.2% of those age 65 or over. Tropicana Products is one of the world's largest producers and marketers of orange juice. Founded in 1947 by Anthony T. Rossi, an Italian immigrant, it had over 8,000 employees in 2004, and marketed its products throughout the United States. It has been owned by PepsiCo, Inc. since 1998. Tropicana's juice trains have been running to northern markets via CSX and predecessor railroads since 1971. In 2003, Tropicana's corporate headquarters were relocated to Chicago when PepsiCo consolidated their beverage business after the acquisition of Gatorade, but their juice production facilities remain in Bradenton. Champs Sports, a nationwide sports-apparel chain, is headquartered in Bradenton, as is department store chain Bealls. Bradenton was significantly affected by the United States housing market correction, as reported by CNN, projecting a 24.8% loss in median home values by the third quarter of 2008. Real estate has shown a recovery since 2012, as home prices stabilize and inventory subsides. Bradenton is served by Sarasota-Bradenton International Airport in nearby Sarasota and is connected to St. Petersburg by the Sunshine Skyway Bridge. The Sunshine Skyway is a 5.5-mile (8.9 km) cross-bay bridge that rises 250 feet (76 m) above the bay at its highest point. Remnants of the old Skyway bridge have been converted into a fishing pier extending into Tampa Bay from both sides of the bay. Manatee County Area Transit (MCAT) buses serve Bradenton along with the cities/communities of Palmetto, Ellenton, Anna Maria, Holmes Beach, Bradenton Beach, Longboat Key, Tallevast and Samoset, with transfers to Sarasota and St.Petersburg. Free trolleys run north-south on Anna Maria Island, as well as to/from various points on the mainland. Amtrak charter buses run through downtown Bradenton outside the courthouse to Tampa Union Station and Venice. The City is governed by a City Council with five members, from which is selected the City's Vice Mayor. The Mayor is elected at-large, as are all five council members. The Bradenton Herald is Manatee County's local newspaper, published daily. The Bradenton Times is Manatee County's local online-only newspaper. Bradenton Patch is Bradenton's local online-only paper. Daily editions of the Sarasota Herald Tribune and the Tampa Bay Times are also available throughout the area. Bradenton is located in the Sarasota-Bradenton radio market. It also receives many stations from the nearby Tampa-St. Petersburg market. WSNN-LD is based in Sarasota but transmits from Manatee County. WWSB channel 40, the local ABC affiliate, is based in Sarasota, but has a transmitter in Parrish, northeast of Bradenton; it is seen on cable channel 7 on most cable systems in the area. WXPX-TV channel 66, the local Ion Television affiliate, is licensed in Bradenton, with its transmitter in Riverview, in Hillsborough County. Bradenton is home to the Village of the Arts, a renovated neighborhood immediately south of downtown where special zoning laws allow residents to live and work in their homes. Many of these once dilapidated houses have been converted into studios, galleries, small restaurants and other small businesses. The Village of the Arts promotes its 'First Fridays' activities celebrating the seasons and different holidays. The Village of the Arts remains the largest arts district on the Gulf Coast. The Manatee Players, who reside at the Manatee Performing Arts Center, have a three-year record of first-place wins within the Florida Theatre Conference and the Southeastern Theatre Conference competitions. In addition, the theatre currently holds the first place title from the American Association of Community Theatre competition. Located on the Manatee River in downtown Bradenton is the South Florida Museum, Bishop Planetarium and Parker Manatee Aquarium. This one-stop museum-planetarium-aquarium offers a glimpse of Florida history, a star and multimedia show, and ongoing lecture and film series. The Parker Manatee Aquarium was the permanent home to Manatee County's most famous resident and official mascot, Snooty, the manatee. Born at the Miami Aquarium and Tackle Company on July 21, 1948, Snooty was one of the first recorded captive manatee births. He was the oldest manatee in captivity, and likely the oldest manatee in the world. On July 23, 2017, two days after his 69th birthday, Snooty died as the result of drowning. ArtCenter Manatee is the center for art and art education in Manatee County. The nearly 10,000 sq ft (930 m2) building in downtown Bradenton features three galleries, five classrooms, an Artists' Market gift shop and an art library featuring over 3,000 art volumes. The nonprofit organization Realize Bradenton works with the above-listed cultural partners to promote Downtown Bradenton as a destination for the arts. It also produces events in the downtown area with a focus on arts & culture like the annual Bradenton Blues Festival, ArtSlam public art festival as well as several smaller public art and music events throughout the year. Additionally, the town is the subject of the We The Kings song "This Is Our Town"; they, as well as the band Have Gun, Will Travel originate from Bradenton. Bradenton is the spring training home of Major League Baseball's Pittsburgh Pirates who play their home games at downtown's LECOM Park. During the regular baseball season, the stadium is home to the minor league Bradenton Marauders who play in the Florida State League in Class A-Advanced. 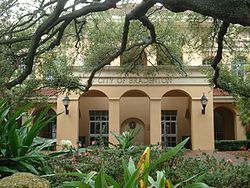 The city is home to the State College of Florida, Manatee–Sarasota Manatees sports teams. Manatee County high schools produce several teams including Manatee High School whose football team was nationally ranked in the 1950s, 1980s, and 1990s and regained their national status in 2009. Manatee High School has won five football state championships. Bradenton is also home to the IMG Academy, the home of the U.S U-17 residential soccer program. The Nick Bollettieri Tennis Academy is located in Bradenton. The Concession Golf Club in Bradenton was home of the 2015 NCAA Division I Men's Golf Championship. South Florida Museum, home of the late manatee, Snooty. ^ "City of Bradenton website". Cityofbradenton.com. Archived from the original on February 23, 2011. Retrieved March 29, 2013. ^ a b c Favorite, Merab-Michal (2013). Bradenton. Arcadia Publishing. p. 129. ISBN 978-0-7385-9078-3. Retrieved June 9, 2014. ^ "Mayor Wayne Poston". Manatee County Government. Archived from the original on April 8, 2018. Retrieved June 19, 2018. ^ a b "Annual Estimates of the population for the Incorporated Places of Florida". US Census Bureau. Archived from the original (XLS) on May 8, 2009. Retrieved August 15, 2008. ^ "Metropolitan and micropolitan statistical area population and estimated components of change: April 1, 2010 to July 1, 2017" (XLS). U.S. Census Bureau. Retrieved May 17, 2018. ^ Grimes, David (November 23, 1979). "The Legends Behind Manatee Names". Sarasota Herald-Tribune. pp. 1B. Archived from the original on September 4, 2015. Retrieved June 6, 2015. ^ Mannix, Vin (June 17, 2007). "The founding of the Manatee settlement". Bradenton Herald. Archived from the original on October 9, 2007. Retrieved August 15, 2007. ^ "NowData – NOAA Online Weather Data". National Oceanic and Atmospheric Administration. Archived from the original on September 17, 2012. Retrieved February 11, 2012. ^ Christie, Les (May 6, 2011). "Double-digit home price drops coming". CNN. Archived from the original on May 15, 2011. Retrieved May 6, 2011. ^ Snooty the Manatee. South Florida Museum. ISBN 978-1-56944-441-2. ^ Mettler, Katie (July 24, 2017). "Snooty the famous manatee dies in 'heartbreaking accident' days after his 69th birthday". Archived from the original on January 10, 2018. Retrieved January 13, 2018 – via www.WashingtonPost.com. ^ Greg Garber. (September 15, 2008). "Bollettieri had a hand in grooming 10 players who hit No. 1". ESPN. Archived from the original on November 3, 2012. Retrieved October 28, 2012. ^ "SI.com – Sports Illustrated – The Magazine – Who's Next? Freddy Adu". sportsillustrated.cnn.com. March 7, 2003. Archived from the original on June 15, 2011. Retrieved February 21, 2011. ^ "Randy York's N-Sider: Tommie Frazier – Huskers.com – Nebraska Athletics Official Web Site". huskers.com. Archived from the original on July 12, 2011. Retrieved February 21, 2011. ^ "Rick Lamb - Official PGA TOUR Profile". PGATour.com. Archived from the original on January 15, 2018. Retrieved January 13, 2018. ^ Sheridan, Phil (March 13, 2011). "Phil Sheridan: Moyer eyes 2012 comeback". Philly.com. Archived from the original on March 18, 2011. Retrieved March 29, 2013. ^ "Player Bio: Peter Warrick". seminoles.com. Archived from the original on July 16, 2011. Retrieved February 21, 2011. ^ "Robinson Preserve". Manatee County Government. Archived from the original on June 19, 2018. Retrieved June 19, 2018. Wikimedia Commons has media related to Bradenton, Florida.